Begin building your dream vacation by choosing from eight Disney’s Deluxe Resorts that offer extraordinary service in spectacular settings with the closest proximity to a Disney Theme Park. These Resort Hotels offer spacious rooms and suites, world-renowned fine dining, enchanting pools with playful water slides and on-site recreation. The personalized services provided to club level guests offers an added convenience to your Walt Disney World vacation. 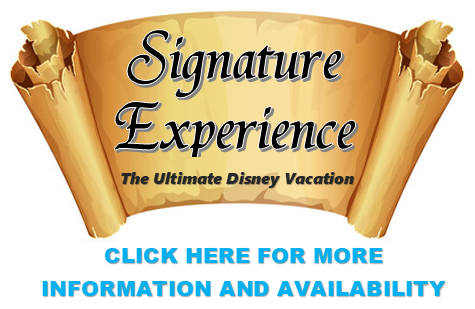 Disney Signature Services—for personal assistance with your vacation. 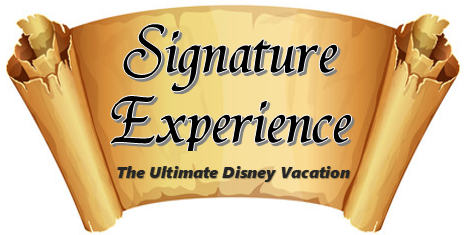 Disney Signature Services Cast Member will contact you to begin the pre-planning process. They’ll provide you with their email address and phone number so you can contact them directly to plan and book outstanding experiences for your Walt Disney World vacation. 5:00 – 7:00p.m. Hot appetizers, children’s corner, crudities, cheese tray, beverages, wine and beer. 8:00 – 10:00 p.m. Selection of cordials and desserts from the resort’s restaurants. Now customize a package and create a magical family vacation that lets you take advantage of all 4 theme parks, 2 water parks in a never-ending world of enchantment! Come and go as you please through all four Walt Disney World Theme Parks and visit more than one theme park on the same day for each day of your ticket. A VIP Tour Experience will set you off on an adventure that includes door-to-door service and an array of personalized perks. LEARN MORE These are the optional available tours. Private VIP Tours: Explore the parks with your own VIP Guide during a customizable experience filled with attractive benefits. The Ultimate Day of Thrills VIP Tour: 7-hour tour that includes lunch and expedited access to top attractions at Walt Disney World Resort. Ultimate Disney Classics VIP Tour: Your Disney VIP Tour Guides will lead the way as you and fellow Guests savor iconic Magic Kingdom park experiences! Ultimate Nights of Adventure VIP Tour: Enjoy a wild nighttime tour of Disney’s Animal Kingdom Park and the Magic of Nature riding attractions with expedited access and exploring a landscape shimmering with lights and brimming with life at night.